Old New Borrowed and Blue is Slade's fourth studio album, released by Polydor on 15 February 1974 and produced by Chas Chandler. It reached No. 1 in the UK and remained on the chart for 16 weeks, also earning a Gold certification from BPI . For the album, Slade attempted to begin breaking away from their usual rock formula. For example, the singles "My Friend Stan" and "Everyday" were piano-led and did not have the typical "Slade" sound. In the US, the album was released by the Warner Bros. label under the title Stomp Your Hands, Clap Your Feet, minus the tracks "My Town" and "My Friend Stan" (as they had been previously released there on Sladest). Old New Borrowed and Blue was recorded amid various touring and promotional activities in late 1973, and also during the headline-making recovery of drummer Don Powell, who was involved in a near-fatal car crash in July, briefly throwing the band's existence into doubt. Despite his critical condition, Powell was able to make a recovery and the band soon entered the studio to record material for their new album. During recording of "My Friend Stan", Powell was still walking with the aid of a stick and had to be lifted onto his drum stool. On the album, the band attempted to continue their usual formula on some tracks, while others took a change in musical direction. The album's title, as explained by Holder, came from the album's content, which the band felt had a mix of old, new, borrowed and blue songs. "My Friend Stan" was released as the album's lead single in September 1973 and reached No. 2 in the UK. Over Christmas 1973, the band would also achieve success with their No. 1 single "Merry Xmas Everybody". 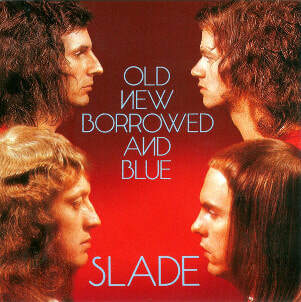 Old New Borrowed and Blue was released in February 1974, reaching No. 1 in the UK, where it was also awarded Gold by BPI prior to its release, based purely on pre-order sales. At the time, a Slade spokesman had reported to the Record Mirror: "The album has sold twice as many cartridges and cassettes than their previous offerings." In March, the album's second single "Everyday" reached No. 3. In America, Stomp Your Hands, Clap Your Feet reached No. 168. "Good Time Gals" was issued there as a single in February 1974. Later in May, "When the Lights Are Out" was also issued in America and Belgium. Both singles failed to make any chart impact. Speaking to the Slade fan club in late 1973, Don Powell commented: "We've just finished recording our next album. It's got a lot of new things on it. Nothing very different or out of character, we've spent more time on arrangements and little ideas and effects." The Sun wrote: "Slade are sitting on top of Britain's rock pile at the moment, and their new album proves they're in the right place. To my mind, Slade have never been a true album band. But this is changing. The Noddy Holder-Jimmy Lea songs are toughening up. And this album is expertly produced." Dave Lewis of Acton Gazette wrote: "Now that they're perched firmly at the top of their own particular tree, Slade can afford to experiment a bit outside the singalong football chorus songs that have made their name. And that's more or less what they do on this album. The arrangements on some of the tracks remind me a lot of the old Beatles' stuff around the time of "Help" - easy bopping, pop songs with good chorus lines and plenty of life. In fact, my only criticism is that overall [the album] sits on the fence between the established Slade bash 'n' crash and the newer style they're trying to cultivate." Thanet Times wrote: "Here is the new album from Slade and that's no doubt about it, it's a winner. The whole album is well recorded, produced and packaged." Pete Butterfield of the Reading Evening Post commented: "Uncomplicated, rousing - and damned good. That's the hallmark of Slade. All but one of the tracks was written by Lea and Holder, and they have so much drive that it keeps the adrenalin flowing right through." American magazine Cash Box said: "One of the most heralded heavy metal bands of all time is back again with another powerful collection of 'Toons' highlighted by the hit single, "Good Time Gals". Raw power is the most immediate sensation you feel from this LP, especially when you listen to "Just Want a Little Bit", "Don't Blame Me", "Find Yourself a Rainbow", and "We're Really Gonna Raise the Roof". Slade continues to capture its stage essence on record better each time and the proof is found here. "How Can It Be" and "When the Lights Are Out" are good examples of well controlled fury. This one's going straight up." Billboard commented: "Interesting set from this top British group, which alternates between their now familiar frenetic wall of sound style and a new, softer sound. Noddy Holder is his screaming self on cuts like "Just Want a Little Bit" and "Good Time Gals", but shows his ability to be mellow on material such as "Find Yourself a Rainbow". The thing this group has always lacked has been a variety of style, and this set provides that missing variety." Al Rudis of the Chicago Sun Times wrote: "The British quartet's new album is actually a lot less rocking than their previous efforts because they are branching out and trying new forms. But when they get down to the rough stuff, they still do it up right. And it sure feels good. Some of the new things Slade tries also work well, [but] on the whole, Stomp Your Hands, Clap Your Feet isn't as strong as some of Slade's older albums." Robert Hilburn of the Los Angeles Times wrote: "Slade, that highly derivative, but energetic and engaging rock group is back for another try. Though the album has more of the standard fireball rockers, it also finds the group, wisely, offering a bit more variety. But the album's not enough to erase the bad taste left by the group's unbearable, overkill concert style. While it would be a suitable follow-up if Sladest had broken the American barrier for them, it isn't potent enough to lift the group's modest standing here." William Welt of Detroit Free Press wrote: "Played at home, with the volume at normal level, Slade's music reveals itself to be rather boring. The group depends on the excitement of live performance in the theater of rock, and this excitement just doesn't come across on vinyl." At the Disc Music Awards 1974, the album was voted the tenth "best album of the year". Dave Thompson of AllMusic retrospectively stated: "It took Slade two years to get around to following up 1972's U.K. chart-topping Slayed?, two years during which the entire complexion of the band had altered dramatically. No longer the rampant yobs out on the stomp of yore, the quartet members placed the rabble-rousing bombast of old far behind them during 1974, and switched their songwriting efforts to more mellow pastures. Old New Borrowed and Blue was the album that introduced the chrysalis to its audience." In a review of Stomp Your Hands, Clap Your Feet, AllMusic writer James Chrispell said: "Full of trademark Slade rock & roll, Stomp Your Hands, Clap Your Feet continues the band's arena style stomp. Although [some] cuts do find them falling into a formula of sound, Stomp Your Hands, Clap Your Feet has enough going for it for most rock fans to come back for more. Dated, a bit, but still rockin' hard." Bob Stanley of The Times retrospectively wrote: "This 1974 effort is the pick of their early albums: Noddy Holder's girder-munching vocals are spread evenly between Black Country rock, Macca-styled ballads, and the odd music-hall blunder. This is joyous, unshackled and unpretentious stuff that reminds you how they rattled off six No. 1s." In 2010, Classic Rock considered the album "superior: reputation cementing" and wrote: "If the wistful ballads "Everyday" and "Miles Out to Sea" were harbingers of the growth that would follow next time around, the album is crammed with mouth-watering commercial, hard rock nuggets including "We're Really Gonna Raise the Roof", "My Friend Stan" and "When the Lights are Out"." "Just Want a Little Bit" is a cover of the 1959 Rosco Gordon song. The song was later recorded in 1977 by The Animals too, of which Slade manager and producer Chas Chandler was bassist. At the time, the song was a regular inclusion in Slade's live set. "When the Lights Are Out" is the band's first track to feature Jim Lea on lead vocals. In a 1974 interview for the "19" readers, Holder jokingly commented: "There's nothing like a good singer and Jimmy's nothing like a good singer." The song was later covered by Bob Segarini in 1978 and American rock group Cheap Trick on their 2009 album The Latest. Lea would also record his own version with his brother Frank Lea under the name The Dummies in 1979. "My Town" is originally appeared as the B-Side to "My Friend Stan". "Find Yourself a Rainbow" features honky-tonk piano as the main instrument, played by Tommy Burton, landlord of The Trumpet in Bilston. In a 1974 fab club interview, Powell stated: "Pub piano is played by a local landlord, Tommy Burton. He now owes us free booze for the rest of the year." On the album's inner gatefold sleeve, the lyrics of the song include an extra verse which was not on the song's recording. "Miles Out to Sea" was another song to later be recorded by The Dummies. Of the up-tempo tracks "We're Really Gonna Raise the Roof" and "Do We Still Do It", AllMusic stated: "Slade fans can be assured that these guys hadn't lost the will to rock out." "How Can It Be" is a country-flavoured track with acoustic guitar. "Don't Blame Me" originally appeared as the B-Side to "Merry Xmas Everybody". In a 1979 fan club interview, Lea said of the song: ""Don't Blame Me" was a time-filler, I think that it was created as that. When it was used as a B-Side, we didn't even know it was being used, it was chosen by the offices." Chandler had persuaded Lea to finish "My Friend Stan" after he heard Lea playing the melody at home on his piano. "Everyday" also features piano and was released as a single at Chandler's insistence. When it was released, the band knew they were taking a risk but "Everyday" would become a firm favourite on stage. The song featured Lea on guitar as Dave Hill was away on honeymoon at the time of the recording sessions. "Good Time Gals" also featured as the B-Side to "Everyday".